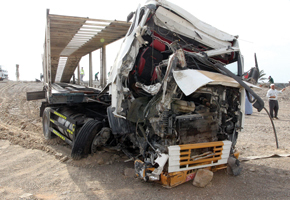 Khor Fakkan: A car carrier met with an accident on the Khor Fakkan Dibba road on Thursday. Traffic came to a complete halt for about four hours as a result of the mishap. The accident, which a senior police officer said, was due to the overspeeding car carrier, took place on the main road near Al Sabekha area. After the driver lost control of his vehicle, it collided into the sidewalk, before violently bouncing off the road to crash into a light pole and then land on a sandy area away from the road, the police official added. The car carrier had a trailer transporting seven cars, one of which tumbled off the carrier and got damaged, he added. While the accident resulted in heavy damage to the car carrier, the sidewalk was subjected to some damage. No injuries were, however, reported in the accident.